It's been mentioned before on my blog (see here) that we love Center Parcs. It's been a lifeline for us as a family; a place we've been able to go annually for a weekend holiday, to meet up with some of our oldest friends. 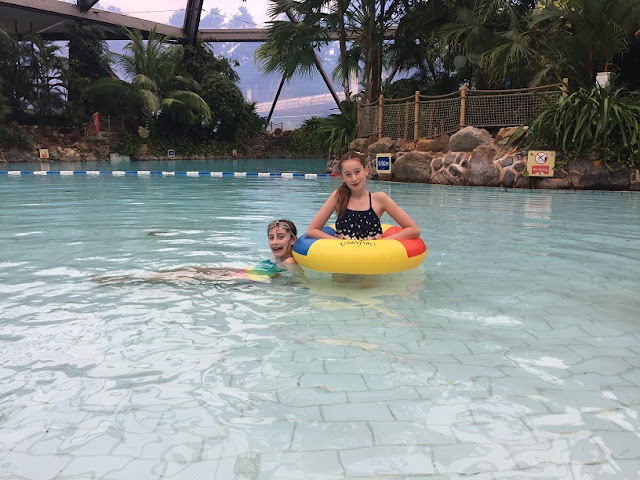 Some of the reasons we return to Center Parcs repeatedly are that the facilities are comfortable, clean and never too crowded. For our autistic girl, the familiarity and knowing what to expect makes her feel at home. We've been to Sherwood Forest the most, because it's closer for our friends who live in other parts of the country, but we've also visited Elveden Forest (Sasha's favourite) and Woburn Forest too. We've enjoyed visits there with the girls' grandparents, and even been alone as a family when we won a competition once. Sasha has always been a water baby; she loves swimming and the Subtropical Swimming Paradise at Center Parcs is where we spend most of our time during our weekend visits. Center Parcs is where she first taught herself to put her whole face in the water and swim underwater. It has become increasingly difficult to go away with Sasha on holiday, due to her anxiety about travelling. Although we've been lucky enough to travel abroad with her a few times, she now feels unable to get on a plane at all due to her fear of something bad happening. Last year we attempted a trip to Disneyland Paris and Villages Nature, which is a Center Parcs site in France, but we drove from the UK rather than flying. The long drive was a challenge in itself; I'll share our experiences with travel and at those resorts sometime soon. 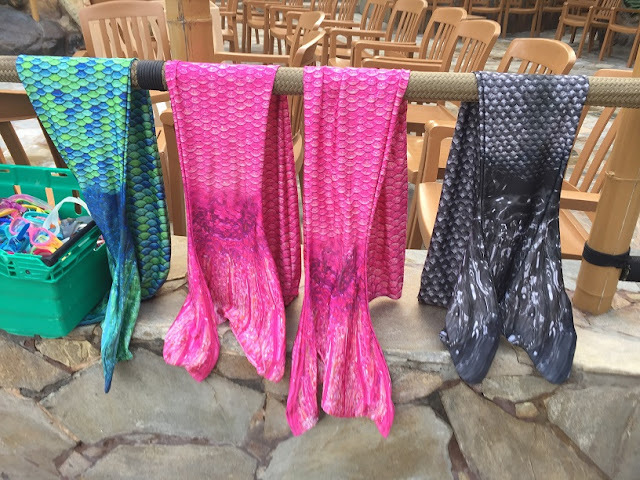 In this post I'm sharing a specific experience we had at the Sherwood Forest Center Parcs a couple of years ago (all paid for ourselves, I've not been asked to write this post, just to be clear!). Sasha was thrilled at the chance to try out being a mermaid. Aimed at 6-12 year olds (I'm guessing that's due to the costume sizes), this is an extra activity which needs to be booked. Ours took place early in the morning before the pool opened for all other visitors, which meant it was lovely and quiet and we could also stay in the pool for when her sister and everyone else arrived. We weren't at all sure how Sasha would get on with having her legs restricted, but she picked it up very quickly and was zooming around the pool in no time. Children do have to be able to demonstrate a good swimming ability before doing this - with Sasha not having had any lessons, we were a bit concerned about how they would test this, but it was just a case of her showing them she could swim 25m unaided. The rest of the session was fairly free-flowing; the assistants showed them how to best use the tail and then spread out underwater hoops and sticks for the children to dive through and collect. Being a mermaid might not be every girl's dream but I'm guessing there's probably a fair few who would jump at the chance to do this. 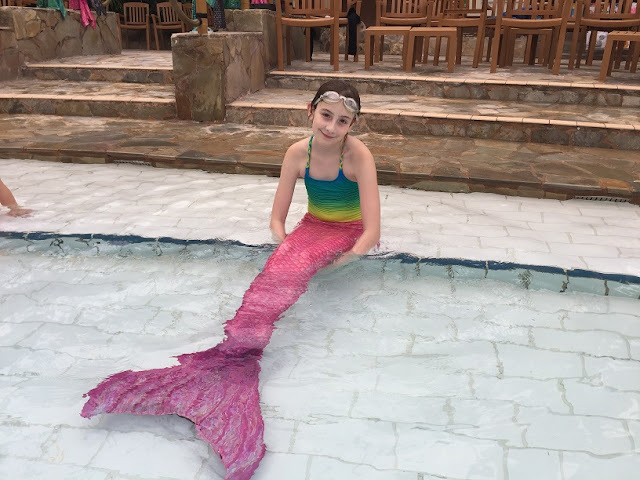 It's not just for girls either - the experience is called Mermaids and Sharks and there was a boy who joined in with wearing a tail/fin during Sasha's session. If you clicked the link earlier in my post about when we won a competition to Elveden Forest, you'll see a video which the girls made, showing you round the accommodation we were staying in there. Below is a video of the girls a couple of years later, showing you round a lodge at Sherwood Forest - you'll see that Sasha was in particularly high spirits that day! One final video to share with you - a super short clip showing Sasha come down a water slide with her Dad in the middle of the rapids at Sherwood Forest. Being able to do the rapids in full was a huge achievement for her; it took a couple of years of her only doing the first half of the rapids before she built up to this. Now, it's her favourite thing to do! I saw this yesterday - totally love the idea mermaid swimming. My little girlie would love it. We've been to Sherwood before but stayed at the Forest Holidays - even centre parks is a bit busy for us at the moment.